It was nice to see the Pirates get the offense going yesterday after four straight lackluster efforts at the plate. Unfortunately, this happened at the same time their pitching got back to where it was earlier, too: highly unreliable. Better than neither of them working, and a win’s a win, but it would’ve been nice to keep some of those pitching gains at the same time the offense started hitting again. Locke was actually good again, giving up just three runs in seven innings (and apart from putting up good results, his propensity for getting past the 5th or even the 6th inning is almost as encouraging in and of itself). Tony Watson, however, gave up four earned runs while only recording one out, turning an 8-3 romp after the Bucs put up five runs in the 7th into an 8-7 nailbiter almost immediately. Two of the runs that scored were runners inherited by Feliz, though one of those game on a ground out. Kang, Polanco, and Joyce all homered. Polanco’s homer was an absolute bomb, and Joyce’s was a pinch hit homer. There’s been talk that Joyce’s ridiculous performance is down to a completely revamped swing, though it’s hard to say if that’s the direct cause, or just the most convenient retrofitted explanation for what might still be pretty random. My thinking is that at least part of this is real, though. If it is, it’s not clear how the Bucs can find too many more at bats for him: all three outfielders are All-Star caliber (and much better with the glove and on the base paths), and even if you stick him at first, Jaso’s having a great year and is a lefty just like Joyce. So all they can really do is continue to spell guys on a regular basis and pinch hit with him often. Joyce is on pace for 200 ABs and he’s slugging almost .700 (he’d be #1 in the league if you dropped the plate appearance minimum a bit, with Kang at #2, by the way). If he keeps doing this long enough, something’ll have to give, even if the Bucs just end up using him as trade bait. But my guess is this player rotation thing is a big part of the team’s analytics, which means they’re most likely to just keep finding room where they can, even if you’d ideally give him a chance to play regularly at this point. Yesterday’s win snaps a four game losing streak and, with Cole on the mound this afternoon, gives them a good chance to take the series before the gauntlet the schedule is about to throw down. It’s weird to dread a Francisco Liriano start and look forward a Jeff Locke start, but here we are. @cantpredictball. I’ve been talking about Jeff Locke’s performance improvement in pretty much every preview of his starts for the past month, and somehow, in his last start, he was even better. He threw a three-hit shutout, the best game of his entire career. Unfortunately, whereas a few weeks ago a decent Locke (nevermind a good one) felt like gravy. Now, with Liriano falling apart and the offense stymied the last four games, it seems more like a necessity. And while using Locke to play with house money is fun, having to actually rely on him to keep your season afloat is terrifying. Locke throws against Jhoulys Chacin, who’s also coming off a complete game: he gave up just one run and struck out 10 against Detroit on May 30th. Chacin’s been pretty good this year: okay K rate, decent BB rate…and that’s about it. None of his peripherals stand out much in either direction. The only encouraging thing I see is that, to complete that game against the Tigers, he had to throw 114 pitches, which is the most he’s thrown since 2011. Unless the Bucs let Chacin cruise through these innings, they should get three or more cracks at a pretty average Angel bullpen. I like the Pirates’ chances to right the ship today. They could really use a couple of wins headed into the difficult stretch of schedule in front of them. 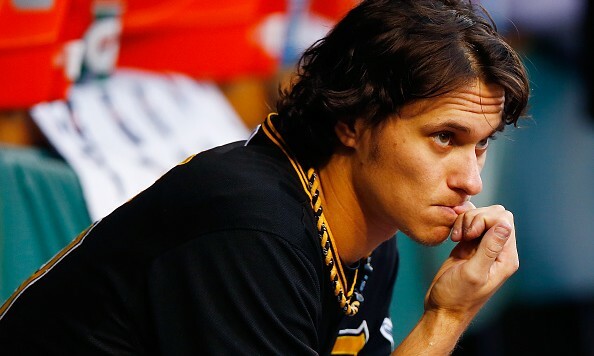 Pirates vs. Diamondbacks: “Will the Real Jeff Locke” Etc. Jeff Locke has been good (or very good) in four of his last five starts, and the fifth was against the Cubs, in Chicago. We still don’t know who’s getting bumped from the rotation in a couple of weeks, but Locke’s recent improvement combined with Nicasio going the other direction the last few starts makes for a pretty good case that it should be the latter. The bullpen has stabilized a bit, which weakens one of the best arguments for keeping Locke (that Nicasio’s profile looks like it would translate well to the bullpen), but the flip side of that is that the Pirates might be one good reliever away from having a—gasp—good bullpen again. A month ago, I felt strongly Locke should be the odd man out. I’ve started to change my mind, at least to the point where neither decision would cause me much consternation. It’s close enough, at least in my head, that I’m glad we get a few more starts from each to make the decision. Locke’s opponent us Rubby De La Rosa, who shut the Bucs down for six innings a month ago. He gave up just one run, but more notably, he allowed only three hits. He’s been excellent in three of his four starts since then, too, and his numbers are artificially inflated by a terrible start to open the season (which, echoing the above caveat about Locke, was against the Cubs). Remove that, and he’s sporting a 2.48 ERA. He’s got an unsustainably low BABIP, but he’s striking out more than a batter per inning. He’s a good pitcher, in other words, and paired against Locke this represents Arizona’s most favorable matchup of the series. The pitching still looks shaky overall, but both the bullpen and the rotation have managed to be decent far more often than not, and as we saw last night, that’s usually enough for this offense.